The Agent project officially started the summer of 2017, during the FairCoop summercamp days in Jura (Switzerland). Several people would question this fact, as much as the very existence of Bernini, who actually stopped appearing - since a while - on the telegram chats (now you find me as @ivanminutillo). To date, Agent development has required 509.4 hours of work paid in faircoin (well over double if we count voluntary ones, always counting only mine), 364 commits on github, divided between the various repositories and 31 open issues and 26 closed. At the same time, the work on Agent allowed the creation of an open source component library in React and a wiki that tells the vision and the main components of a decentralized, open economic infrastructure based on shared vocabularies and protocols. From the beginning, Agent has been able to count on a trusted group of people to be his family. FairCoop has some rare individuals inside it and some of them have taken charge - armed with patience, experience and intelligence - of the newcomer, helping it to evolve and improve day after day. 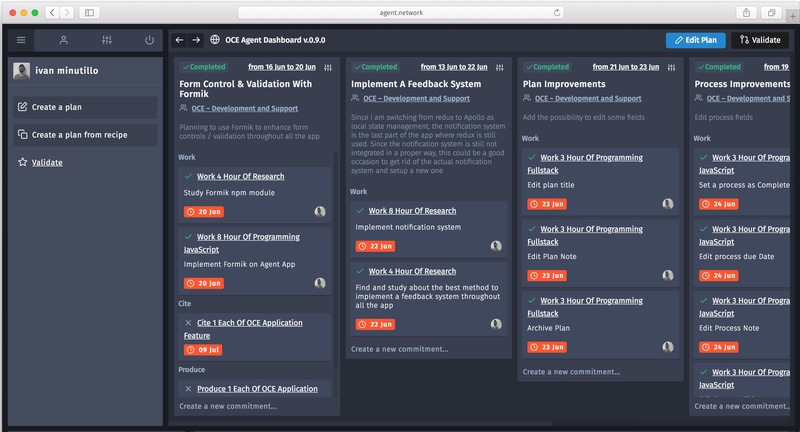 The process of co-creation and development of Agent has been exciting, unnerving and training. Being able to collaborate on a daily basis with Lynn Foster & Bob Haugen is fortunate. They have helped me to question the classic pragmatism of writing software according to the most fashionable methodologies, uniting the political and social vision with the technical one. Not to mention the human side and the dedication that they show day after day, in carrying forward the vision and the development of an infrastructure that can support new and still unknown next economic systems. Always trying not to impose absolute ideas, but supporting almost in every line of code alternative ideas to capitalist ones (I advise you to deepen their work directly on their site). The software is written only as a support to a concrete need exposed by a community. Each feature is implemented according to the needs of the community that adopts it and the priorities are decided in assemblies and revised month by month. 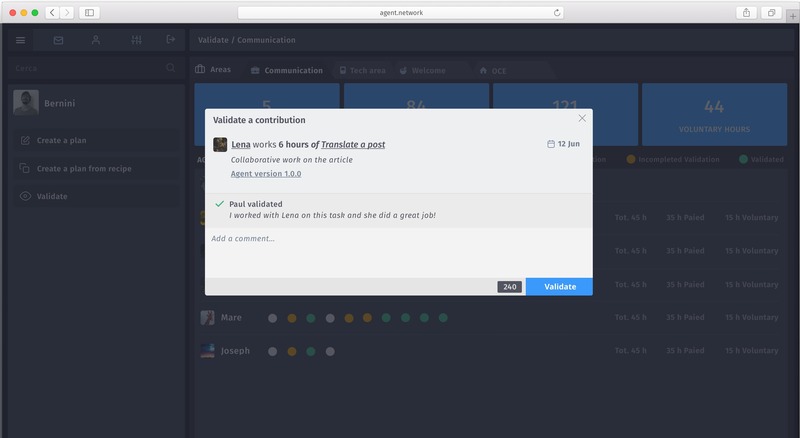 So during 2018, Agent evolved based on the needs of Open Coop Work, the first group to use it. 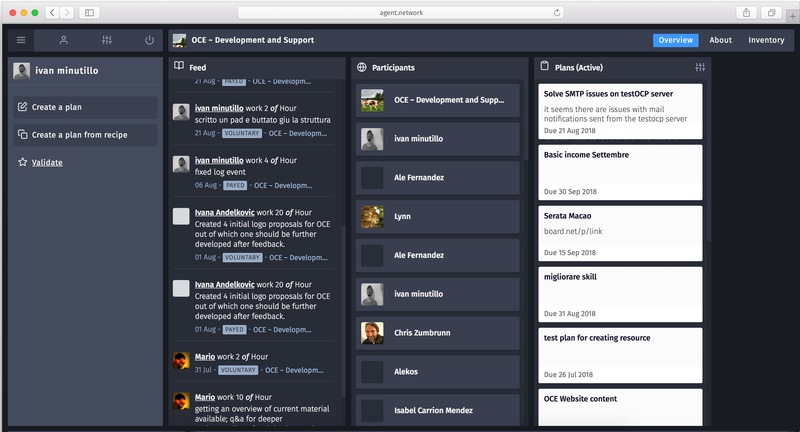 Open Coop Work (OCW) is a cooperative created to organize FairCoop’s internal work. Within OCW there are 5 areas divided by themes (Tech, Communication, Common Management, Welcome, Circular Economy). Each of these, through assemblies, establishes the work to be done on a monthly basis. OCW is an open network and anyone can participate in one or more areas and help complete the work. Every month, OCW validates the work of each participant and distributes a fee, according to a protocol decided in assembly. The flow just told, is in principle also what today the software allows to do. In short, Agent facilitates the creation and distribution of value within a decentralized and horizontal ecosystem. It allows you to create work plans and to each participant to enter his own contribution. Each plan can contain processes created by a single group or different groups, creating a contamination of skills and visions. 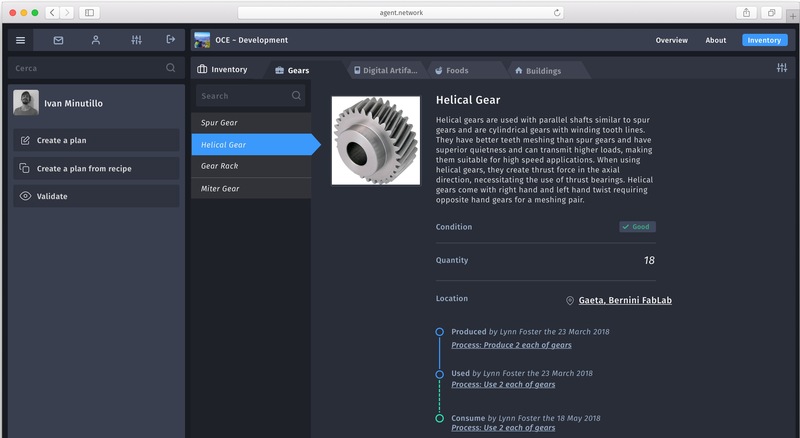 It allows to have a general vision of the events that happen in the groups of which the user is part of, the open or closed plans and the available resources. It allows to validate, according to a well-defined protocol, the work done by each individual, and then make the monthly budget distribution. Local nodes, cultural centers and other groups outside the FairCoop ecosystem are testing the adoption of Agent. The added value for their needs, beyond the organization of the workflow, is the ability to track resources, which can be produced or used during work plans, or exchanged between other groups of the network, encouraging the creation of a network of circular economy. Another key feature is the wallet, which allows you to manage crypto and social coins in an easy and transparent way, inside groups. These features are currently being worked on, and will occupy a good part of the development untill the end of 2018. The future of Agent is decentralized and will not be called Agent. 2018 was full of discussions and research, they took place in different chats and communities, which eventually led to the choice of ActivityPub, as a protocol on which to implement the first version of a distributed economic software, extending its vocabulary (ActivityStream) through ValueFlows. The future, in an embryonic version, is already on GIT and is called Pub Of The Commons. A Pleroma fork, developed by Mayel, in order to create a generic ActivityPub server, on which we will build our economic network. Each person will have his / her instance, and can federate with other participants, be they other individuals, groups or bots, keeping full control of the data produced. The software will keep track of all the events created within the various networks, like a sort of personal dashboard. 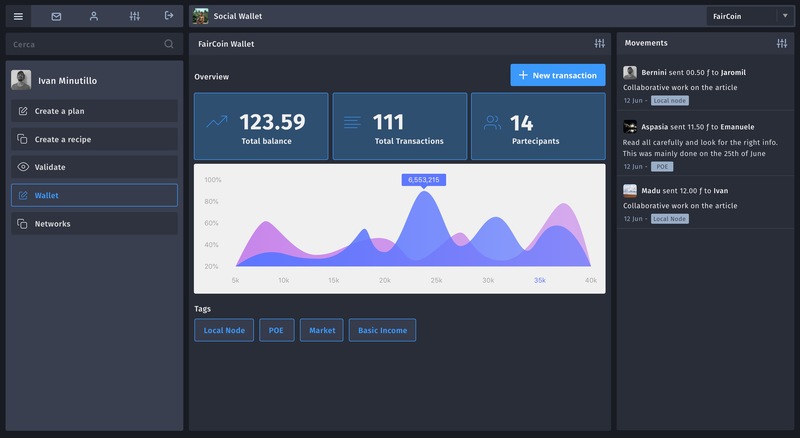 This dashboard will allow the user to perform all types of activities: be it social, economic or political, through a plethora of applications that will implement compatible protocols and vocabularies, helping to form an open cooperative ecosystem. The software can (should) be forked and adapted according to the needs of each person / group, encouraging the experimentation of specific political and / or economic models. The choice of ActivityPub as a protocol for the decentralized infrastructure is also a political, as well as a technical choice. But the technical and political reasons for the choice of ActivityPub will be material for another article as well as the next Agent name and its visual identity, financing strategies, roadmap and business plan for the next 3 years. However, the goal remains the same. Creating tools starting from a clear political vision: of participation rather than representation, to facilitate new models of social and economic organization that are alternative to the capitalist model. 🎂 Happy first year of life Agent, or Kamasi, or as you will call … and best wishes to us!